The Blanton’s Gold Edition is only available in International markets and was developed to agree to the palettes of single malt and cognacs drinkers throughout the world. I found this to be quite true and there are many similarities between some barrel strength single malts and Blanton’s Gold. Like all Blanton bourbons, this expression is aged in the famed Warehouse H, where Col. Blanton himself use to age and choose the single barrels that he would use when he would entertain friends and special guest. They found that the center cuts of this warehouse aged bourbon better than any others and many Blanton fans would agree with this. As there is no age statement on the bottles, the barrels are chosen when they are “ready” rather than at a specific age. The Gold edition is bottled at 103 proof rather than the standard 93 proof of the Original Blanton’s. This higher proof really makes this quite a different and unique bourbon even from the standard expression. Appearance: First off, Wow!! What a bottle. 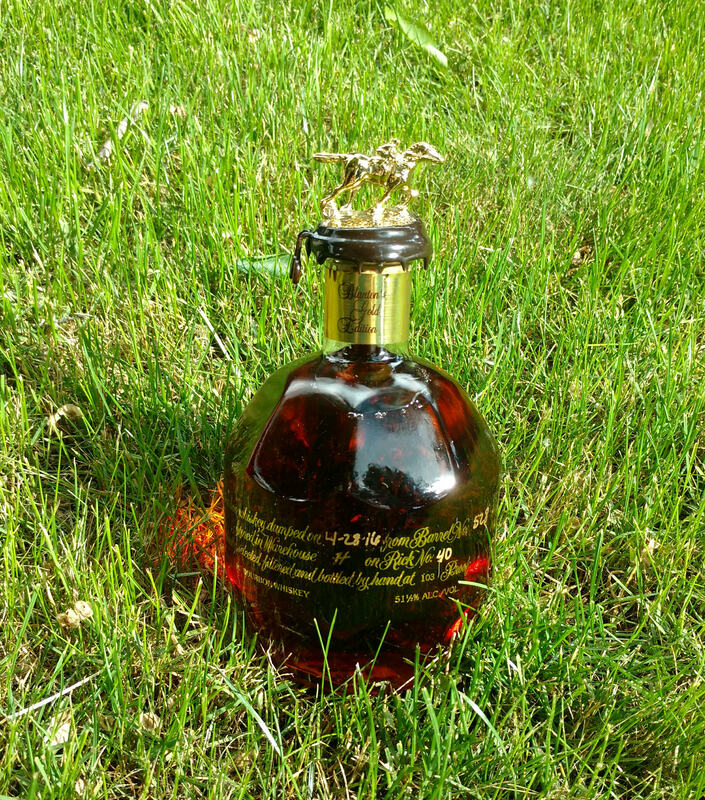 From the classic Blanton’s horse and jockey gold plated topper to the golden lettering, this bottle speaks class. The nectar inside is just as lovely. A light golden amber but thinner than I was expecting. Taste: Big alcohol up from ( more than I expected for sure ) with oak and spice that drys the palette. There is a note of caramel but a really medicinal note comes into play and reminds me of cherry cough syrup. This isn’t a bad thing however and really balances the dry spice notes. A splash of water calms this perfectly and leads to a nice dry and woody taste. Finish: This bourbon really has a drying woody finish with hints of cedar, spice, and slight barrel char. There is a mellow warming as it finishes that is just long enough to invite you back for another sip. There is a lot of complexity from the amount of time in the barrel, though I would say this is a younger bourbon that has been aged in extremes of weather and really pulled out some char and tannic influences from the barrel. It is not overly oaked, however and the youthful sweet notes really help to balance the bourbon, especially on the nose. There has been definite care in producing this bourbon and choosing the right time to bottle. Since this is a single barrel product, there will be slight variations but overall, I think this is a solid representation of the Blanton’s Gold. This is a drying bourbon and one that sets itself apart with the balance and uniqueness of the degree of those spicy, tannic, and woody notes. It is a great steak night bourbon. They have found a good balance to compete with similar notes in single malts and many scotch fans would also like this bourbon. If you come across this for around $75 US, I say give it a try. It will have a place in any collection on the bottle alone but, the juice inside is a fine example of perfect aging and quite enjoyable.